Out take: The first appearance of the shadow. Out Take: Wow is that green! Out Take: That Darn Shadow! And a golf cart! Out Take: Such a photogenic couple but when I try to crop away the errant shadow, Nydia starts to look like a floating head. Testing the Light – no problems with shadow to start. White balance is a bit off. Love Paula and Artie gazing at each other; would have liked a little warmer lighting. Revised White Balance helps, but poor Gilbert barely shows up against the railing. Turns out, this guy is a falconer. He definitely knew what he was doing with Cody, who doesn’t always sit well for people. The guy was so good with the owls. And had big blue eyes, but I loved his expression in this one. I just wish I’d had time to go to vertical when he moved the owl from the side to the front. The S.O.A.R. event on St. Patrick’s Day went wonderfully. Over 200 people came and I think the event exceeded their expectations. Watching children hold birds was especially a treat–how many people get to hold a bird of prey on their arm before they’re even a ‘tween? As far as my venture in trying to get people to donate in exchange for photos, well, it turned out to be quite the challenge. I practiced with my new lighting as much as possible beforehand. I worked out a workflow ahead of time. I setup my camera to shoot in JPEGs since there would be no time for post processing. I took all my equipment out to the site the night before and did lots of testing to pick a good location to set up. I tested my 100mm f/2.8 lens in the space I had to work in and prepared to shoot with my 17-55mm f/2.8 lens based on the results. I did a lot of test shooting with my strobes at home with the 17-55mm lens. I brought Pat along so he could help solve some of my more difficult problems. I didn’t set a custom white balance, which I really needed because of no post processing. I forgot my CF card reader, which blew away my workflow until Pat went to Wal-Mart. My extension cord crossed a major traffic area; Pat and a roll of duct tape to the rescue! I didn’t test the process for burning CDs beforehand. Having not burned a CD in about 10 years, this wasn’t wise. My workflow resulted in drive failures, ruining several CDs. I found a work around, but it wasn’t easy. While these mishaps didn’t negatively affect my fund raising in the end, they did negatively affect my confidence. As you can see from the gallery, I did not exactly produce stellar images. While the circumstances were challenging, I have to face the fact that I didn’t have the skills for the challenge–yet. So many things to work on! 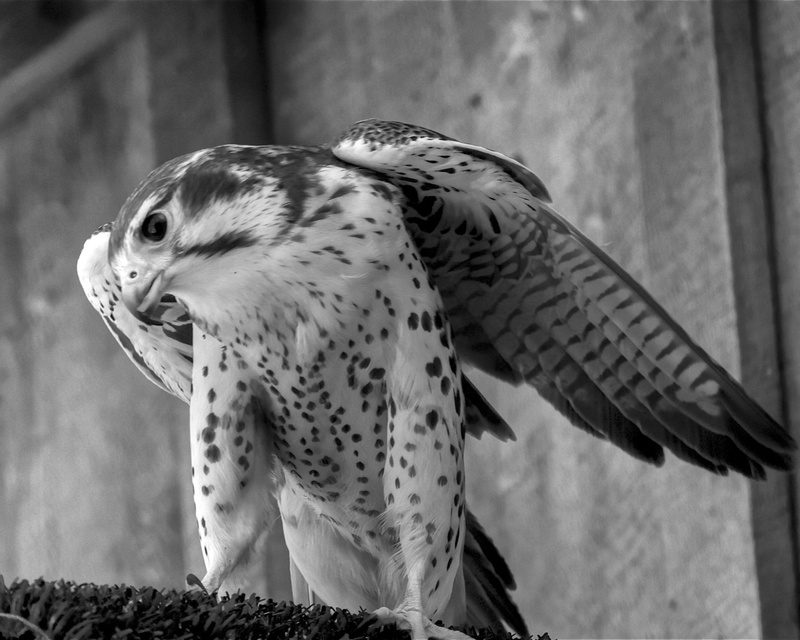 On the up side, my black and white Prairie Falcon portrait sold in the silent auction. This entry was posted in Birding, Chattanooga, Photography and tagged Photography, Portrait photography, Saint Patrick's Day, wildlife photography. Bookmark the permalink. Awesome is a good word for them, too! (Responding to comments out of order.) People who have no interest in birds are just blown away when they get to hold one. It’s really cool to watch. Well, we live and learn and hopefully we enjoy the experience…Tisen sure looks like he is enjoying himself. Fantastic birds–such a great project! Ah yes. Learning is what it’s all about. Plus, I got to hang out with a bunch of great people and all those fantastic birds (you are right–fantastic is the right word for them).